The title says it all. I have been very busy repairing, making and finishing. 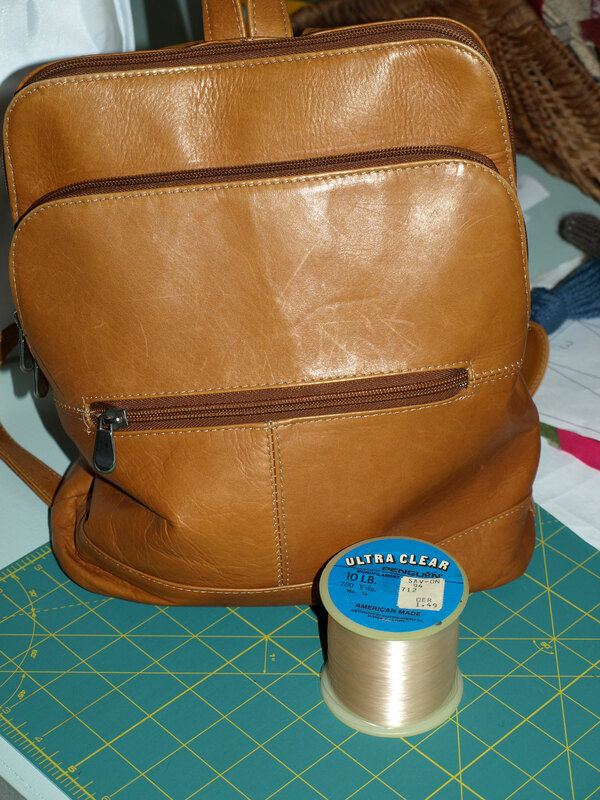 My purse/backpack which was coming apart on the upper left corner. I used 40-year-old fishing line that I collected somewhere along the way from my family. The stitching went into the old holes, but I had to back track to get a continuous looking line of stitching. I then used a suture knot on the inside to tie it off. For your interest; these are very good knots for quilters who hand tie their work. The extra twist locks the thread so it stays put while you finish the tying. Oh yes, and no need to ask for someone’s finger, because the knot is good for package tying too! LINK: Not to worry; it’s only thread and diagrams. The toes go first, note the repairs on the two laid out, and then the heels. This one may be too far gone, but at the price of Moreno socks I will give it a try! You saw these doll quilts/table toppers in a previous post but here is a closer and clearer look. Every once in a while I lose my mind and do a bit of hand quilting. This one was small and I took lots of breaks to save my eyes from strain. Nope, not done – yet. I had to go Frogging on this one twice! First on the center blocks because I let intuition take over instead of referencing the pattern. I was so proud of my work until I looked back at the pattern picture and realized it bore no resemblance to the original! And again when I realized that two setting blocks, one each on the center sides of the bottom, were sewn incorrectly. 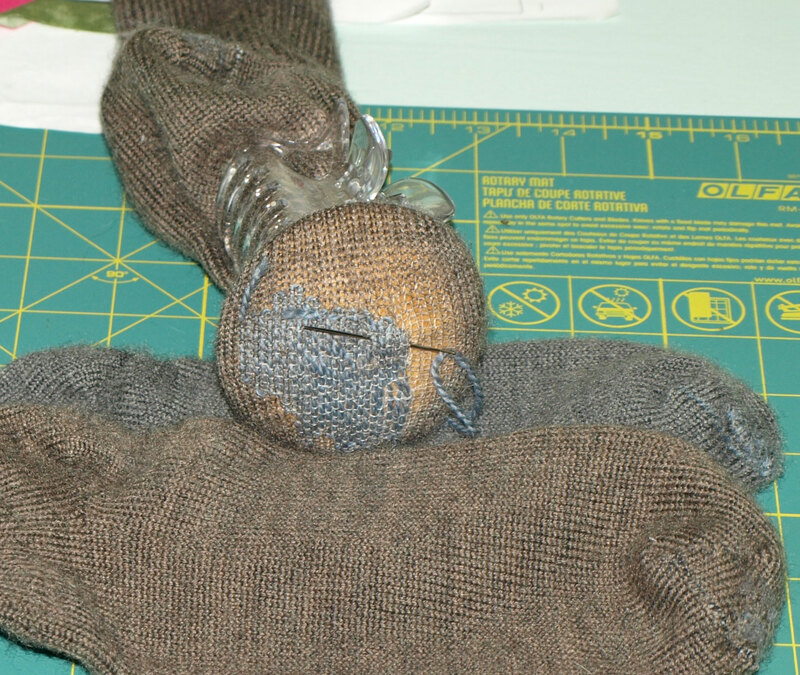 I think I saved its looks by picking the stitches to release the seam and pressing it to the outside. 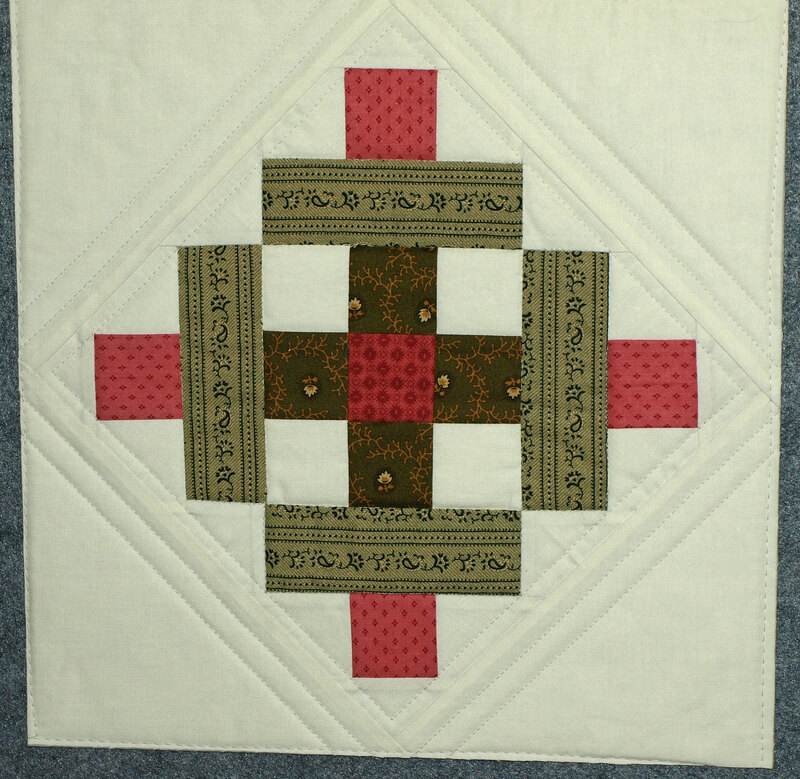 I then restitched and quilted just to the outside corners of the blocks. This one is waiting for the fabric I had to order for the binding. It may be here today! OK, back to work, but before I leave I will mention that I am joining up with Carla of Granny Maud’s Girl in the Bee Myself and I group. 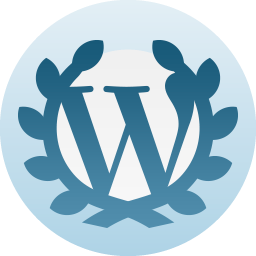 They post progress at the end of the month on projects that are made just for themselves. It gives us permission to be just a bit selfish and make for ourselves and not everyone else. Feeling guilty about making if it isn’t for someone else or for sale is really stifling to the creative process sometimes. 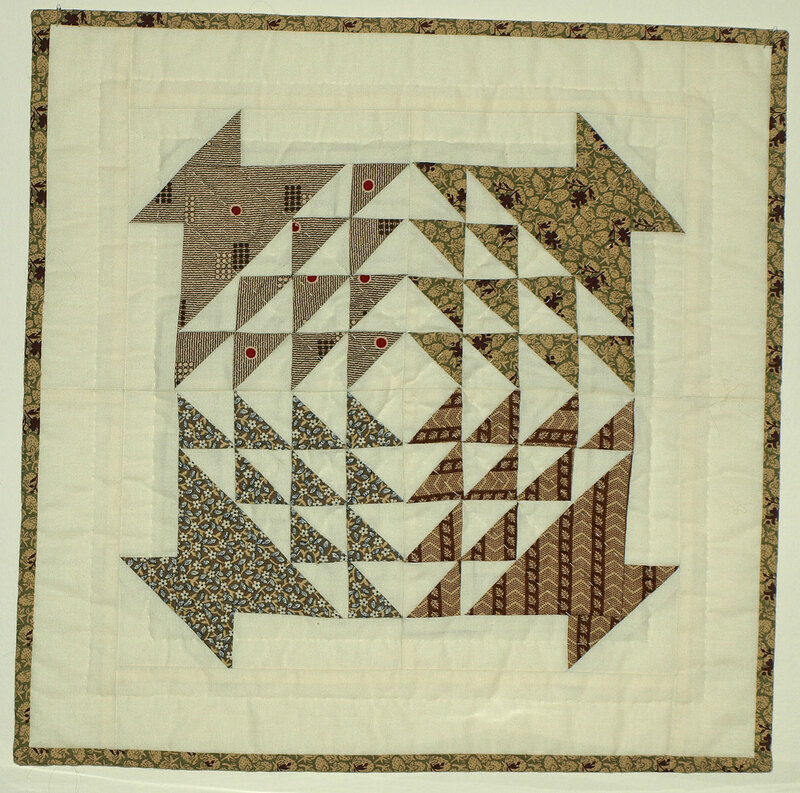 CREDITS: Mini quilt patterns are from the Temecula Quilt Co. in Temecula, California. The line is “Mini a Month – 2018”. For those interested, there will be a new set available for 2019. I do indeed get that: “both of these need starting, now which shall I do first?” is a common problem. Sometimes it’s an easy choice: a new block or make dinner. Sometimes not so easy: a scrappy block or an F2F block! What a busy person you are. True, Tom, and it is fun to be getting things accomplished! You have been busy! I laughed to see the fishing line. I used that to repair a big, braided rug I had that was in the process of unbraiding itself. It worked beautifully, and now, ten years later, it’s still holding on just fine. I smiled to see the sock, too. I still have my grandmother’s darning egg, and the old Christmas tin where she kept her needles and such. It looks like you’ve got the routine down pat — it really is fun to restore something like that. possible that it would be easier for me to hold onto when I work. Thank you Claire! It may be considered ‘brave’ by you for me to do so now, but in the beginning I must think of my work as cruel… Bob wouldn’t wear my early efforts. LOL! I have had a lot of practice working on his socks and he wears them without complaint today. That’s quite a darning task you’ve taken on but worth it I think. 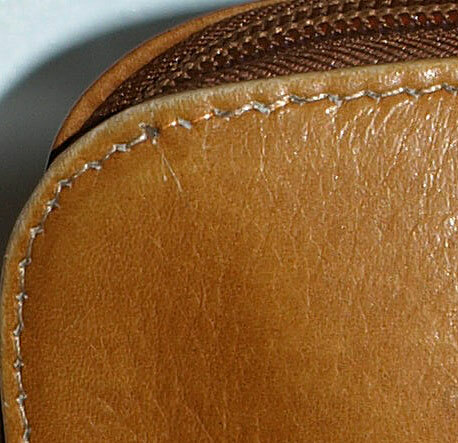 When I looked at the close-ups of the stitches, I soared wayyyyy back in time when I owned a hand ‘awl’ which was used to repair saddles and bridles… Ha, that was wayyyy back when I also owned a horse! Lisa, I’m imagining that you were good at saddle repairs. Do you miss your horse? (I would if I’d ever owned one.) I have an awl. Mine is used in making binding for trimming out clothing and binding quilts. Hi Neighbor! N. West Ga.
Barbara, I found this in my spam! Sorry. Hi neighbor! North west Ga.
Hello, Barbara! Glad for your visit. Please come back again soon!